We are into the last week of the Merry Monday July Challenge. I am so excited about how many people played along with us so far and there is still a little time left. I went with a CAS card for this week. 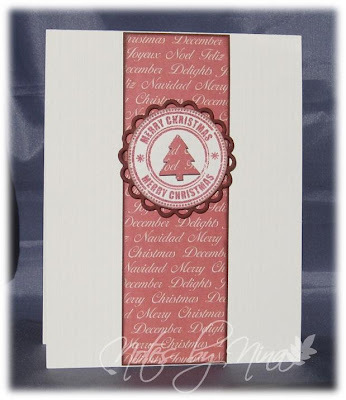 I stamped the Tree Seal in red and fussy cut the tree from designer paper and popped it up with foam tape. I added a simple strip of design paper with a small red frame. Supples: Natural white and red card stock, Designer Paper - Dovecraft, Technique Tuesday-Merry Christmas Tree Seal, Spellbinders. I always seem to be in need of Thank you cards, and I was trying for a little elegance with this one. I created a border with a punch then added some designer paper. 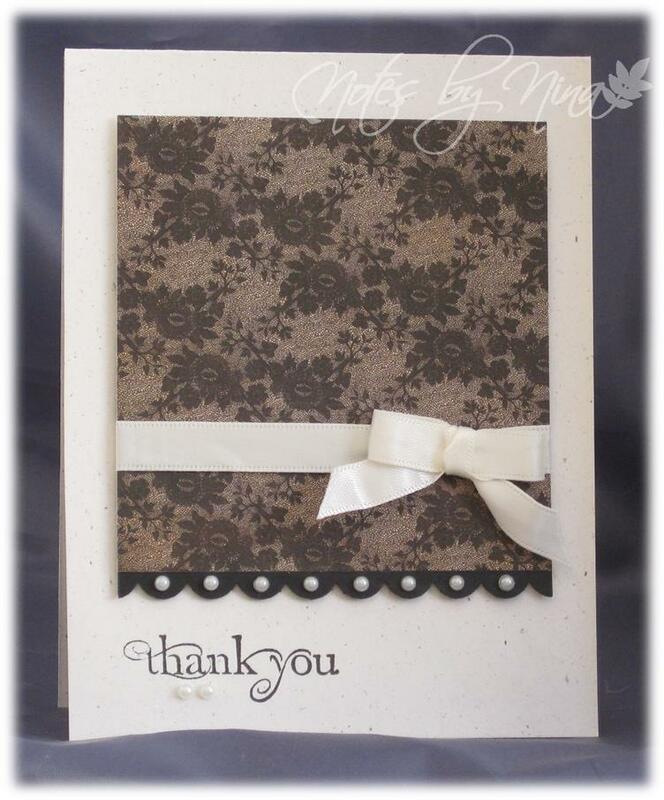 I stamped the sentiment in a deep brown and added some cream satin ribbon and a bow. I finished with some pearls. Supplies: Natural white and black cardstock, Designer Paper - Basic Grey, TPC Studio-Flourish Text, pearls, ribbon, misc punch. 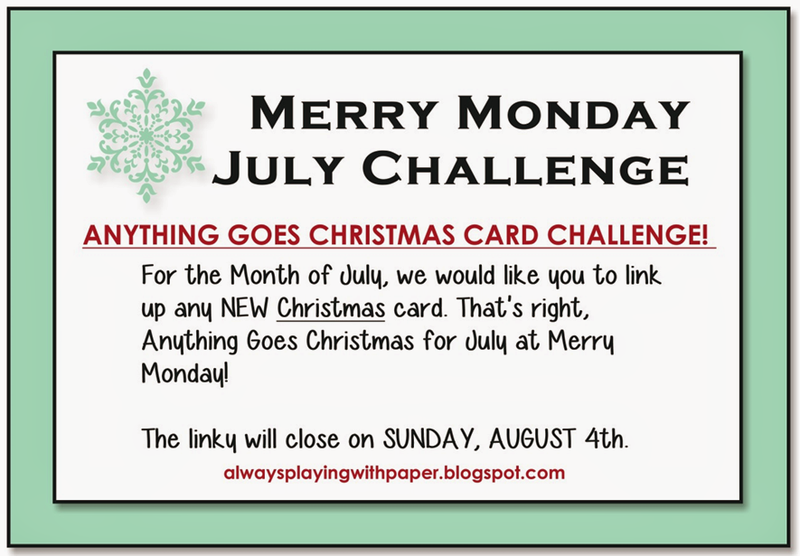 As we carry on with the Merry Monday July Challenge it has been wonderful to see all the amazing cards that have linked up. 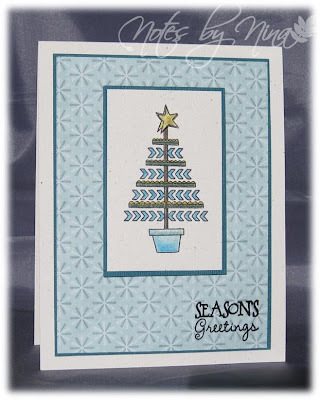 I stamped and coloured this cute tree and I fussy cut a second topper star and popped it up with foam tape. I heat embossed the sentiment in black. 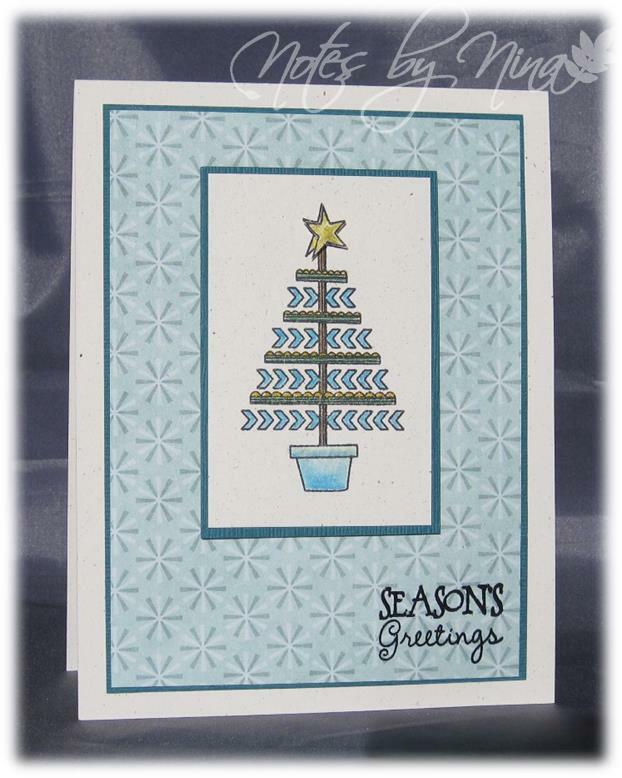 Supplies: Cream and turquoise card stock, Verve - Holiday Greetings. Stop by Lesley’s blog, Always Playing with Paper to join us and play along. I have a vacation coming up and I plan to visit a few craft supply stores during my travels so I have been trying to use of some of my current supplies. That just makes me realize that I really don't need to shop... that won't stop me though :) new stuff always inspires creativity. I used my Cricut to cut out the Thanks and popped the panel up with foam tape. I used some simple layers to create the frames. I finished with some pearls. Supplies: Cream and brown cardstock, Designer Paper - Basic Grey, Cricut, pearls. I love these cute little birds. I heat embossed them on designer paper then fussy but them out. I added some background clouds and some two toned grass then finished with a sentiment. Supplies: Natural white and brown cardstock, Designer Paper-Echo Park, The Alley Way Stamps-Priceless Joy and Crazy Critter. We are halfway through July (already) and we have had such a great response to the Merry Monday July Challenge, we have well over 100 entries already. A little gold can go a long way :), I added a couple of layers and used some texture. 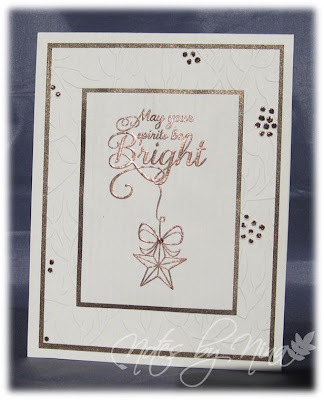 I heat embossed the sentiment and then added stickles for a little extra glitter. Supplies: Cream and gold card stock, Verve -Bright Spirits, Stickles. Happy Anniversary to my wonderful, amazing, fantastic husband - whom I love so much. 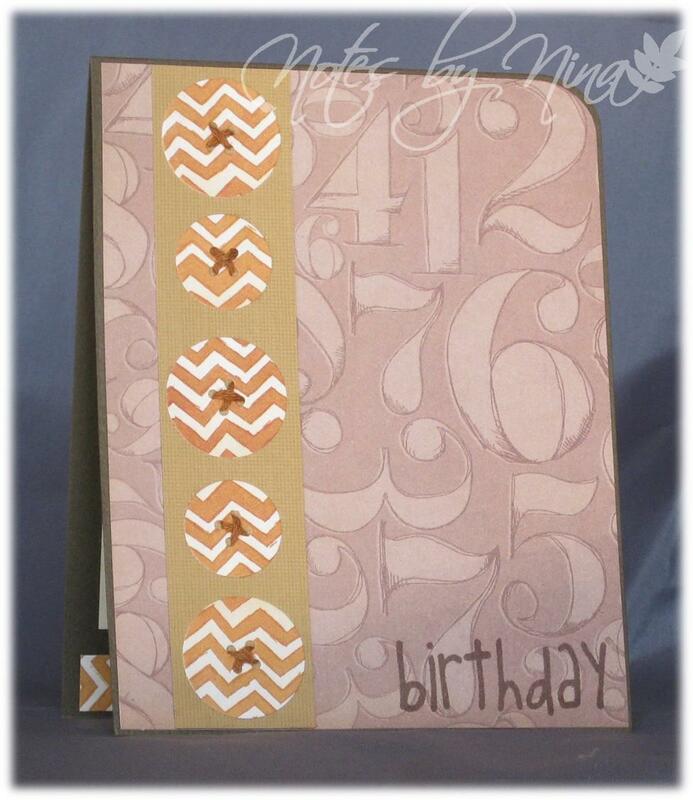 I put the designer paper to work for me, then added in a popped up sentiment and layers hearts. 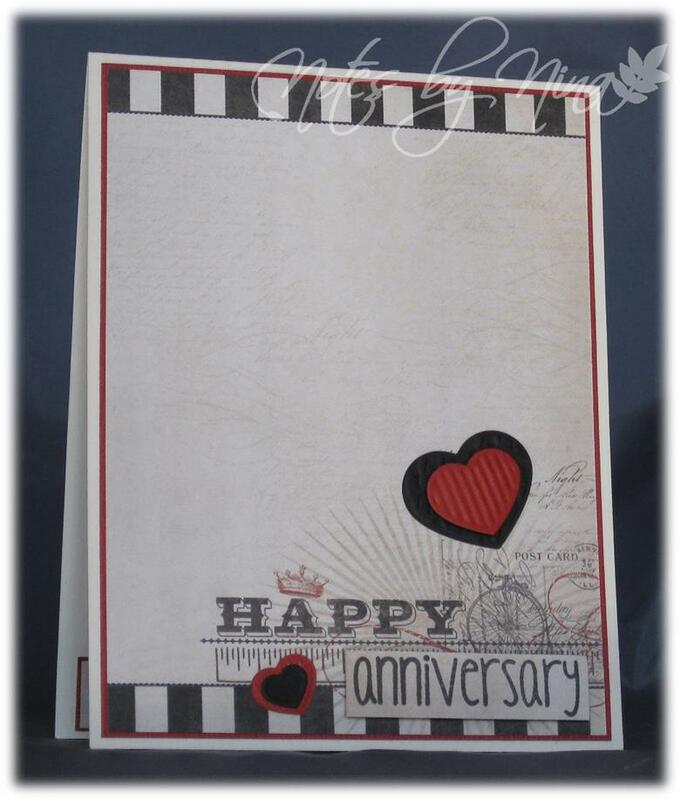 Supplies: Natural white and red card stock, Designer Paper - My Mind's Eye, The Alley Way Stamps - Mad Gab, Sizzix Heart Embosslits. 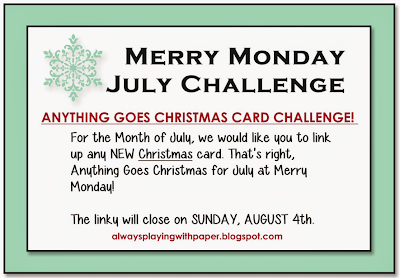 Merry Monday is doing an Anything Goes July challenge. Take a look at Lesley's blog for all the details. I started with stamping the snowflakes with Versamark and using Winter Wonderland embossing powder which is white with silver sparkles. I then heat embossed the sentiment with black. I added a couple of layers of card stock to create a frame. 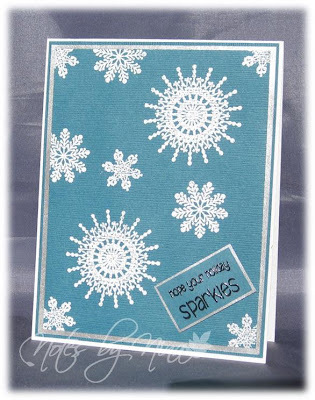 Supplies: Cream and turquoise card stock, The Alley way Stamps - Holiday Sparkles, embossing powders. 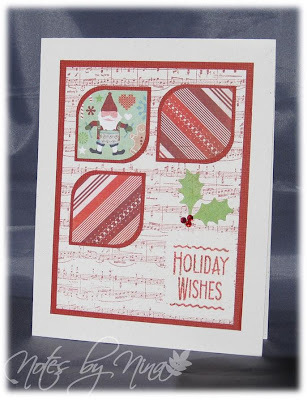 I had a chance to spend a little time in my craft area today so I created a card for this week’s Muse Challenge. I used Laurie's card as a sketch to create a masculine birthday card. I used a brown card base and added a layer of DP. I stamped the sentiment on the DP then added a row of buttons. Take a look at the this weeks Muse card HERE. 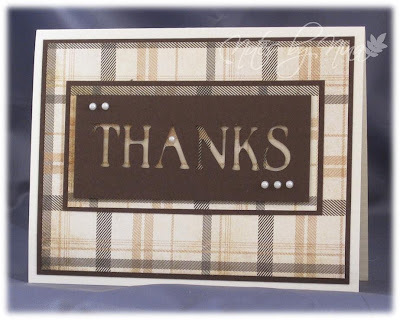 Supplies: Brown and tan card stock, Designer Paper-American Crafts, Embosslets - Buttons, The Alley Stamps - Jibber Jabber. We are having some super nice summer weather, it makes it hard to hang out indoors :) but I wanted to try out the newest sketch for Tuesday Morning Sketches. This is such a great layout, I may use it more than once. 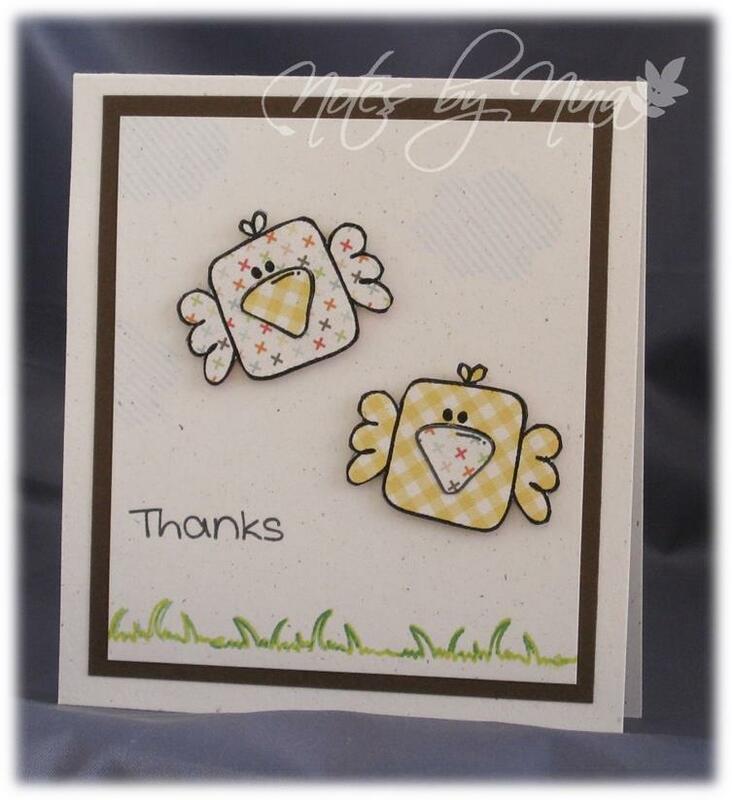 I stamped the image then used Spellbinders to cut it out. I did the same for the frame but split it down the middle so I could frame the smaller circle then used foam tape to pop them both up. I used a die cut for the button and added foam tape to that as well. I finished with some twine and the sentiment. Supplies: Natural white and navy cardstock, Designer Paper - Bo bunny, Technique Tuesday - All Aboard, The Alley Way Stamps - Get the Point, embossing folder, twine, misc die cuts and punches. Happy Birthday Canada :). We are having a stunning long weekend and it feels like a perfect start to summer. My goal was to try for CAS cards for this month, however my cards did not exactly work out that way. I added some simple layers then used square punches and my Corner chomper for the panels. I added in a heat embossed sentiment. 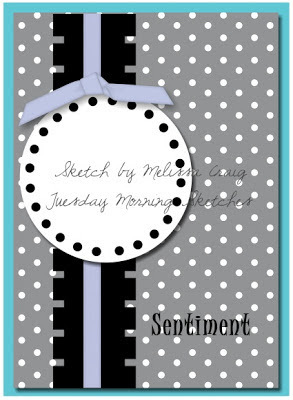 Supplies: Cream and red card stock, Designer Paper -Basic Grey , Stampendous-Music Score, misc punches, gems. 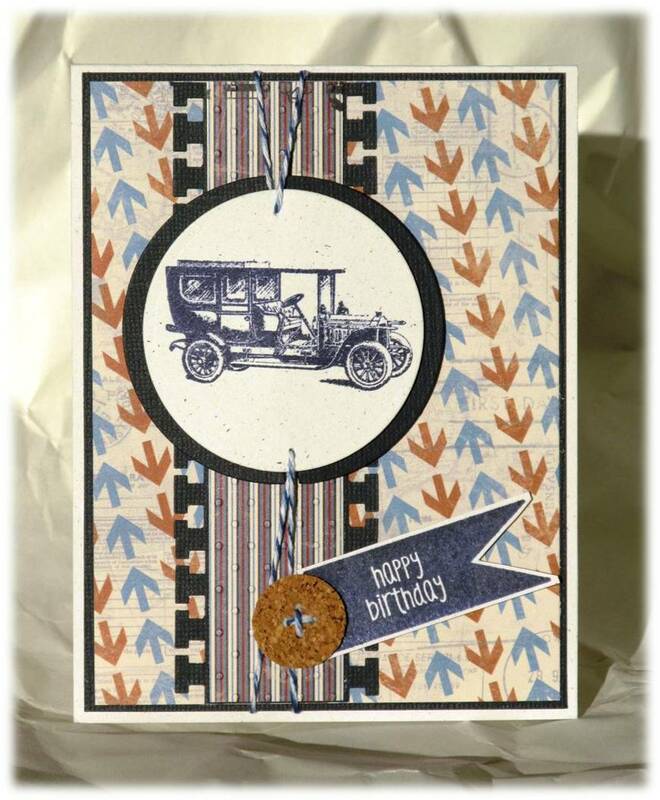 Stop by Lesley’s blog, Always Playing with Paper to see what the Design Team has created, join us and play along.